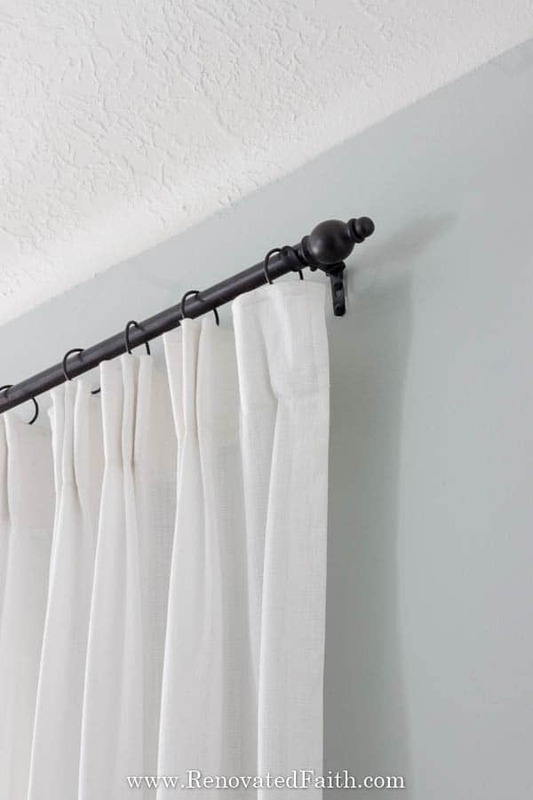 Why spend a fortune on curtain rods when you can easily make DIY custom curtain rods that look just like those sold at Restoration Hardware. 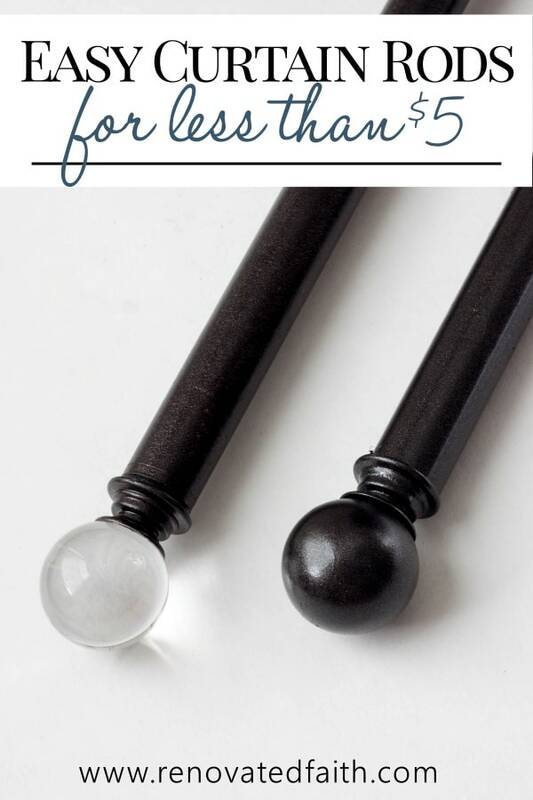 I saved over $500 by learning how to make curtain rods out of electrical conduit and here I share a way to make finials out of furniture knobs giving you endless style options! This post may use affiliate links at no extra cost to you. See my full disclosure here. When we moved into our house, the existing curtains looked like something out of a 1960 Sears catalog and they had to go. Knowing I had 16 windows to buy for, I realized the cost would add up fast for something so simple. Since I wanted to spend more money on curtains, paint and accessories, I decided to figure out a way to make my own DIY custom curtain rods. We moved into this house a few years ago knowing we had a LOT of projects ahead. 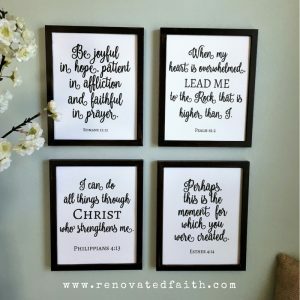 Every room was crying out for a makeover, but honestly, I wouldn’t have it any other way. 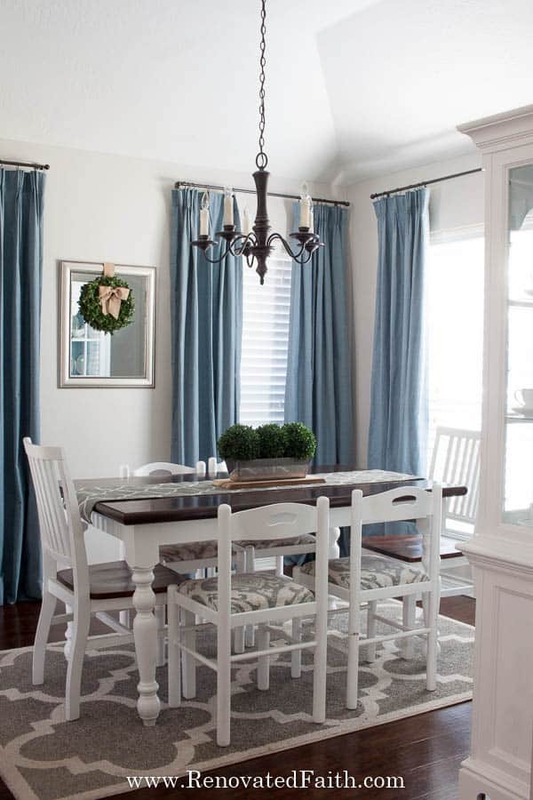 Making curtain rods was another opportunity to put our own touch on a house we love so much. 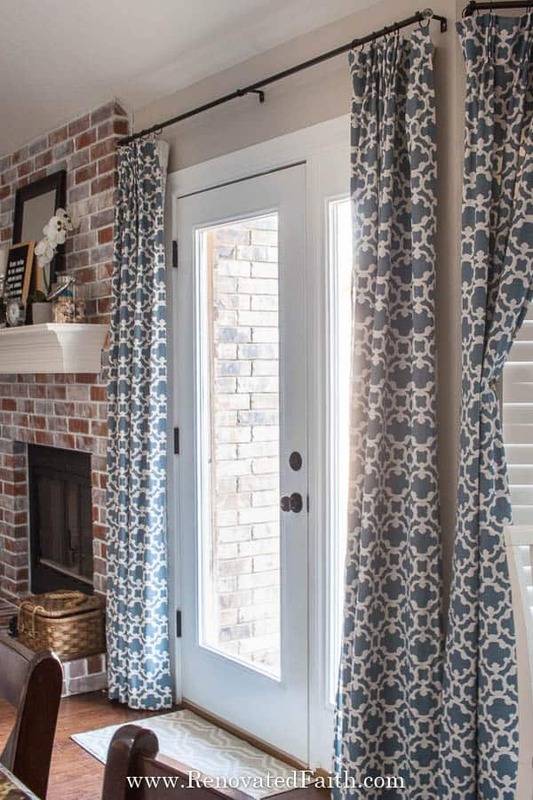 When making DIY custom curtain rods, there are a few different materials to choose from including electrical conduit (galvanized pipe), wooden dowel rods and also PVC pipe. I decided against the wooden dowel rods because they are three times the cost of conduit and pvc and they also don’t come in longer lengths for long curtain rods. 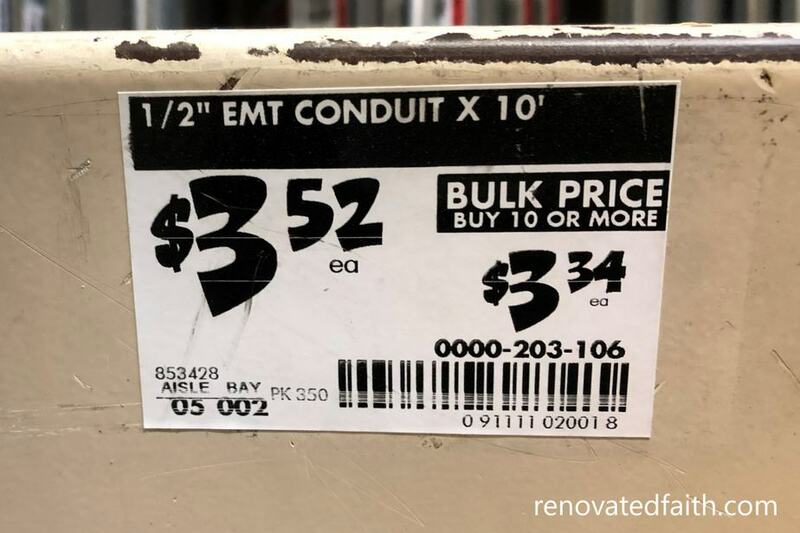 When it comes to electrical conduit versus PVC, I chose the conduit because although they are both cheap and come in long lengths, the PVC requires more brackets. That’s because the PVC is much less rigid and can sag easily – not a look you want! A non telecoping curtain rod is one that is not adjustable because it is a custom curtain rod cut to the correct size of your window. Therefore non-telescoping rods are much more professional looking as you don’t see that overlap where the rods meet up. 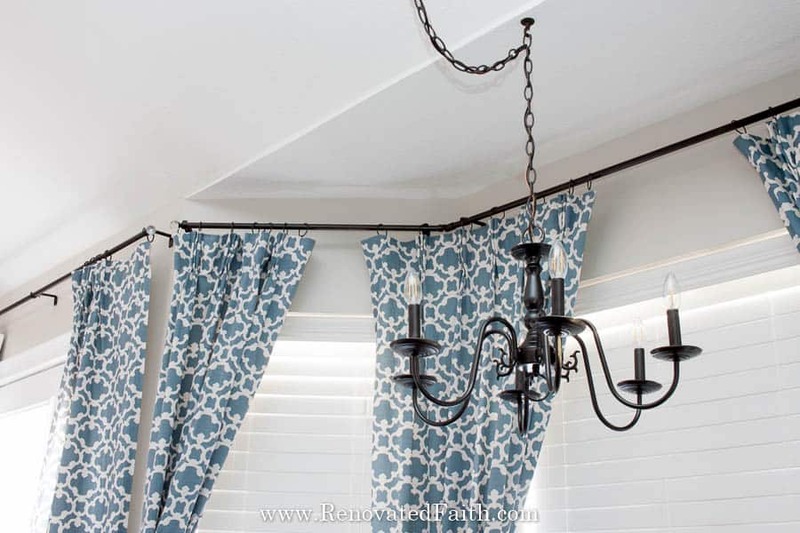 The beauty of making DIY curtain rods out of electrical conduit is that you also gain the professional look of custom curtain rods! Electrical Conduit (I used ½ inch which is actually ¾ in. in diameter). 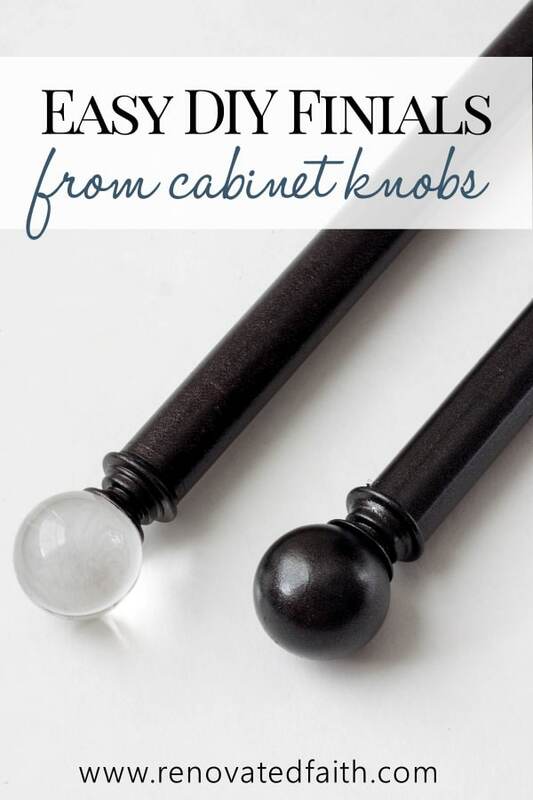 Cabinet Knobs – These are my favorite and you can spray paint the whole knob or just the base in any color! Click to see the current price here. Pipe Cutter – Ask around before buying! I bet someone you know has one you can borrow. 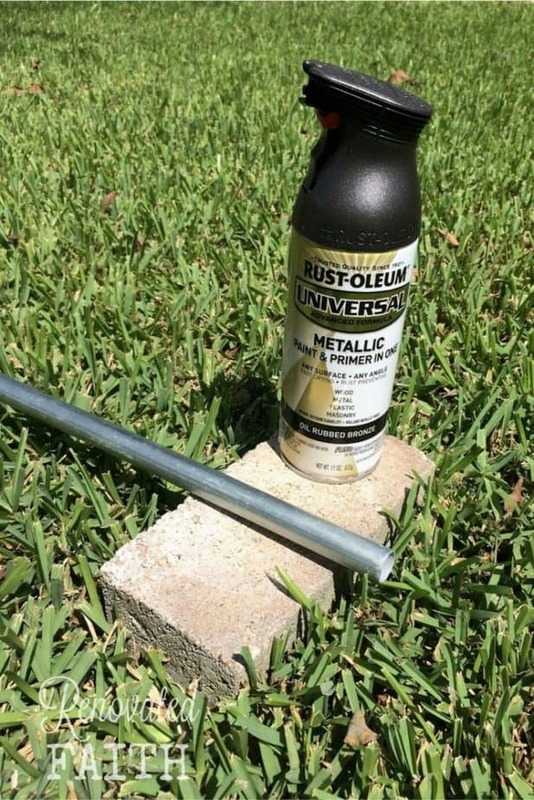 Rustoleum Universal Spray Paint in Oil Rubbed Bronze – This is my absolute favorite spray paint and it comes in any color, whether you want black, gold, satin nickel curtain rods or my favorite, oil rubbed bronze! Curtain Brackets – If you just need two, this is the best price but click here if you need more. Rod Connectors for Bay Window Rods (optional)- This one provides a seamless look with the size of conduit we are using! 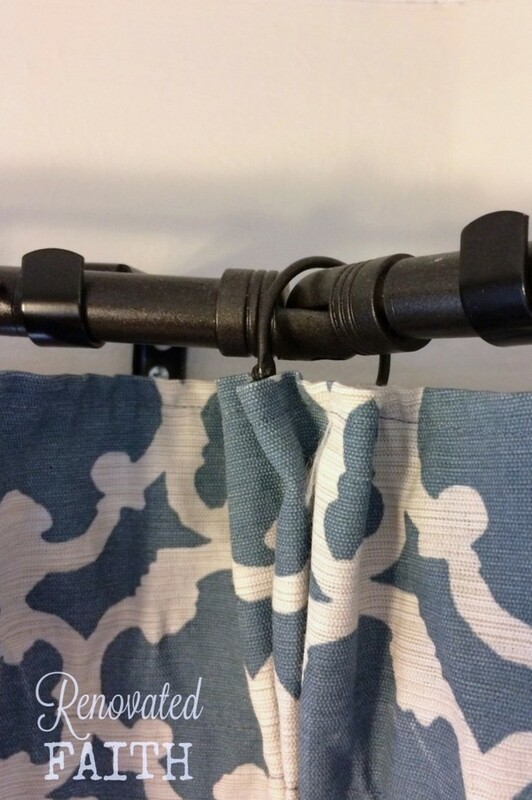 As you get your shopping list together, be sure to check out my post on DIY Pinch Pleat Curtains where I show you how to make your own curtain rings that are almost free! 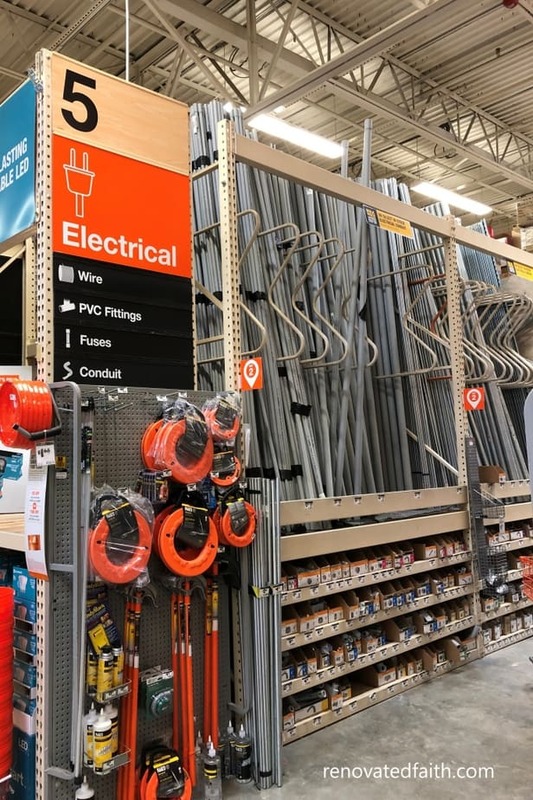 First, go to the electrical section in your favorite home improvement store for electrical conduit. Like I said, I had considered wood dowels, but you would see the wood grain when it was spray painted. PVC was another option, but it was too flexible, which is why electrical conduit was the perfect choice. Electrical conduit is my new best friend. Not only is it durable, and easy to cut, but it is also extremely cheap. An 10’ piece of 1/2” electrical conduit will run you less than $4.00! Compare to the Amazon Basics Curtain Rods of the same size that will run you almost $30 each and that’s just for a basic rod. 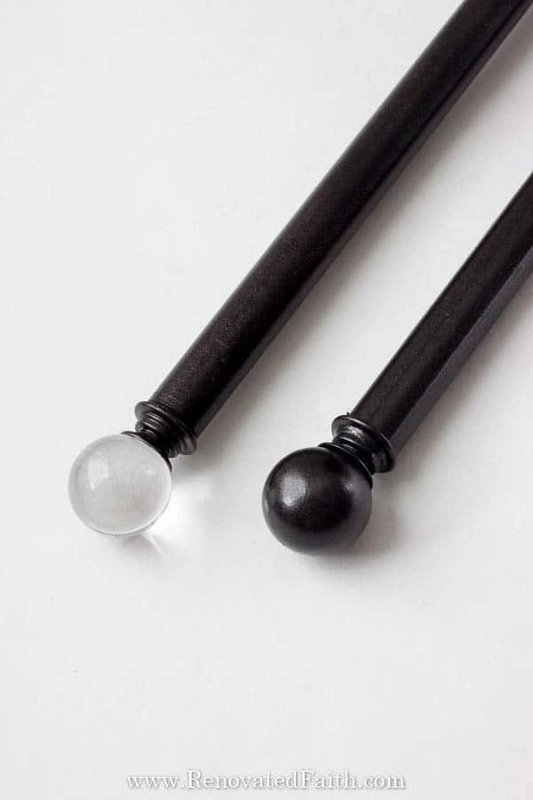 These will look just like Restoration Hardware’s basic rods that will cost almost $200. Be sure to pick conduit that is straight as some can be a little bent. 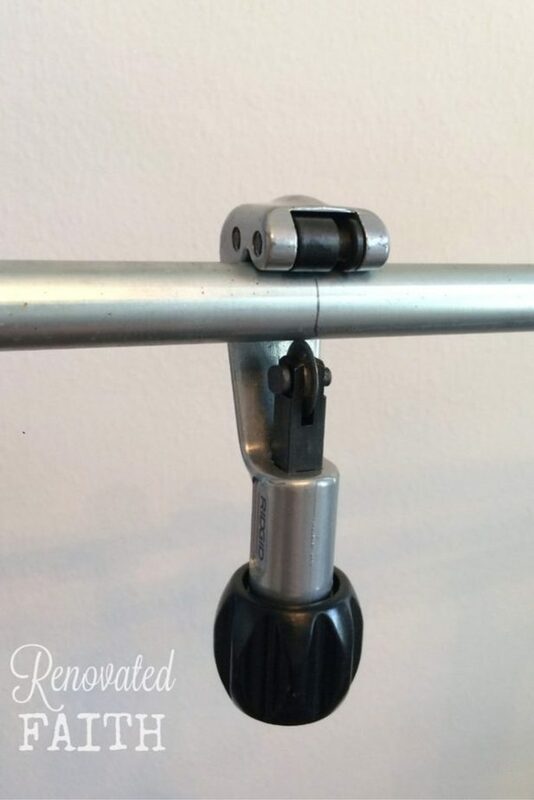 I found curtain rod brackets at Amazon but you can also find them at Home Depot. Make sure your bracket will fit your rod diameter. These worked nicely with the ½” conduit. You don’t want the length of your rod to be the same or even close to the same as the width of your window alone. 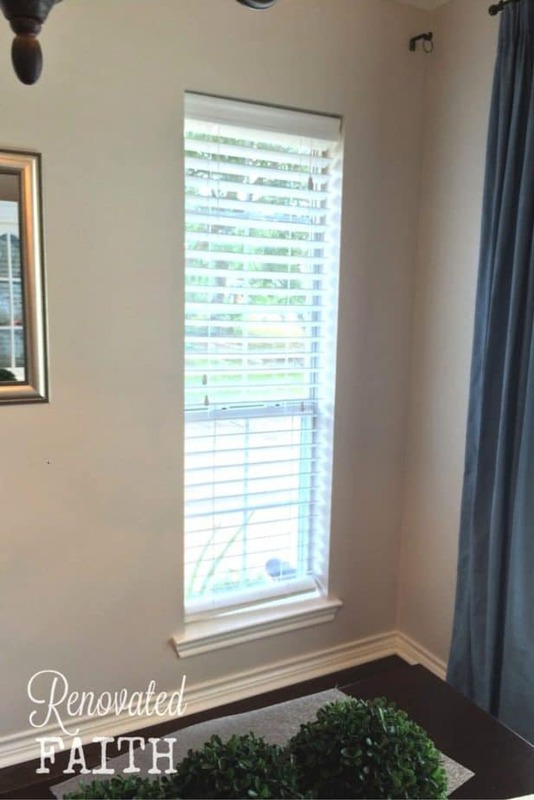 We want the curtains to accentuate the window and make it look larger than it really is while letting in as much light as possible! In other words, you want the inside edge of the curtain to just barely cover the inside edge of the window. This gives the illusion of a MUCH larger window. In several cases, I extended my rods over a foot on each side of my windows. I did this to make the windows look larger than they actually are and to allow more light in! Notice how tiny this window is but it looks so much larger when I extended the curtains out as far as they would go. No one would be able to guess how small these windows actually are! I like to hang my curtains so they are 4 to 6 inches from the ceiling. Measure away from the ceiling and make a small mark with your pencil there. Now you want to install your curtain rod brackets at the width you decided on earlier and at this height. 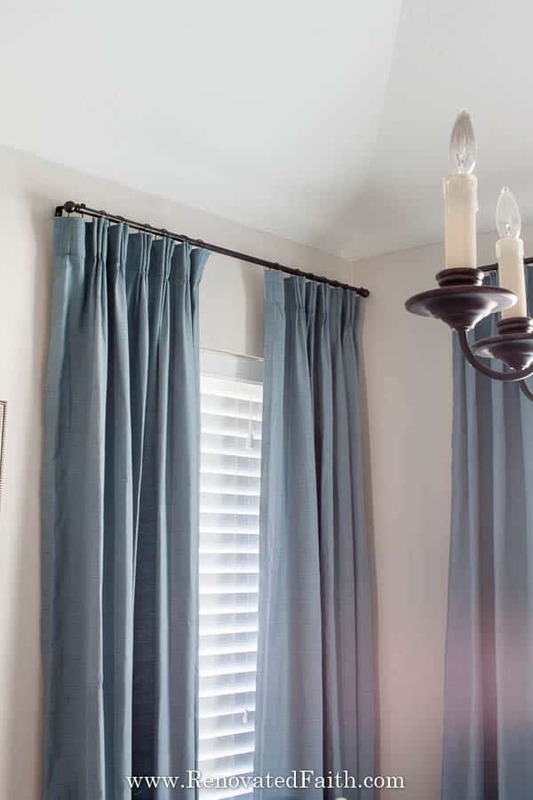 In determining the length of my curtains, I like to add 4 inches to this length (from the rod to the floor) because I will actually hang up my extra long curtains on the rod, pin them to the correct length of 1/2″ off the ground and then hem them. I know what you are thinking, my friend. 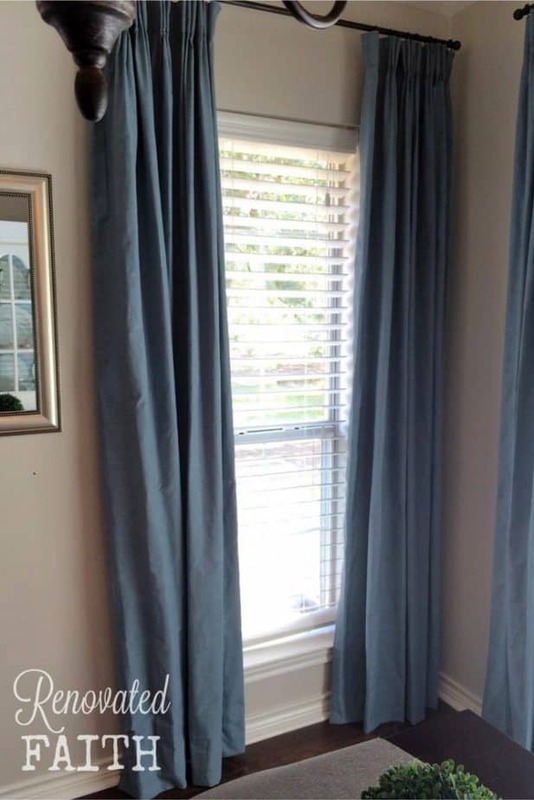 It sounds like a lot of extra work to rehem curtains but for me, it is easier than the possibility of making lot of extra holes in the wall trying to get the brackets to be the right height for the rod. I do this because often times when I get curtains, one end is longer than the other but this method customizes my curtain to my window. Also, your curtains are now truly customized to your window. For example, I bought 110″ curtains from Target which was much easier and cheaper than making them from scratch or getting them custom made. 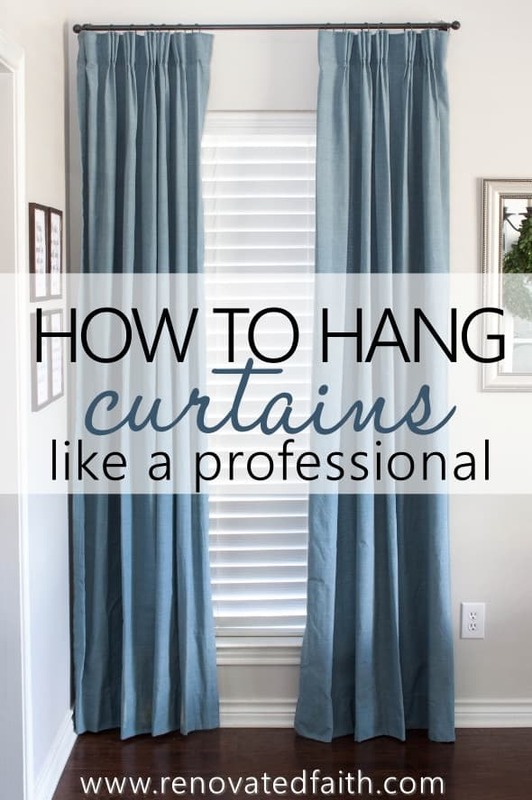 This method is the one sure-fire way to get your curtains the right length without adding a lot of holes in the wall because of misplaced brackets. Plus you have professional looking curtains at a fraction of the price! Here are the three different curtains I bought for this project! Mark the new rod size with a pencil so you know where to cut. To cut the rod, you simply tighten the pipe cutter so the round blade is in line with the line you marked. Tighten it just enough that you can still rotate it around the rod with some tension. Keep rotating the pipe cutter around the rod until it gets loose again, tighten slightly and continue to spin it. Do this until the groove in the rod is deep enough that the end pops off at the cut. It might take a minute or two but I promise it works! Be sure to check around to see if you can borrow a pipe cutter. They are not very expensive but I bought one for myself, only to find out my husband already had one and my dad had two. Woopsie! Now it’s time to work on the knobs! For the windows in the kitchen and living room, I wanted the look of these round glass finials at Restoration Hardware but wasn’t about to pay $80 a pair, especially when I would need so many. So, I stumbled upon these 30mm Glass Cabinet Knobs at for just over $1 each. Jackpot! Super glue the head of the screw to the bottom of the knob. 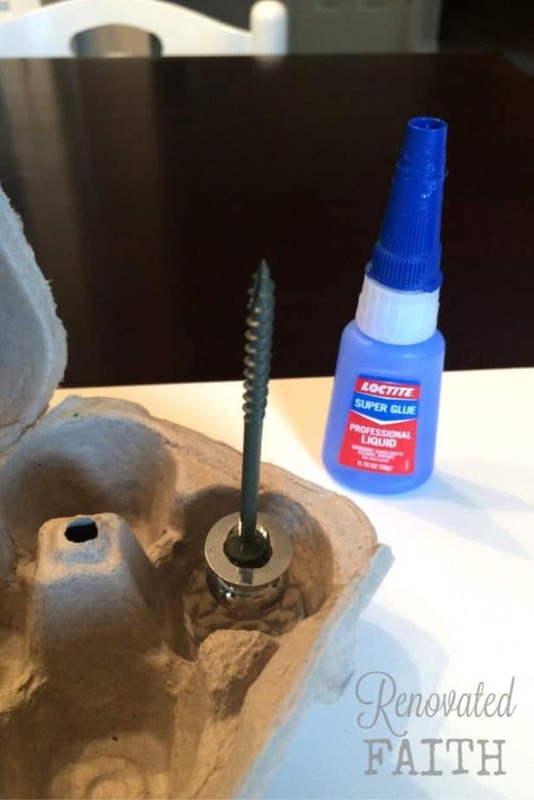 I applied an ample amount of super glue and used an empty egg carton to hold them in place as they dried. As they dry, you will see some white residue from the glue on the base of the knob but the paint will cover that. Let the finials dry 48 hours to be on the safe side. 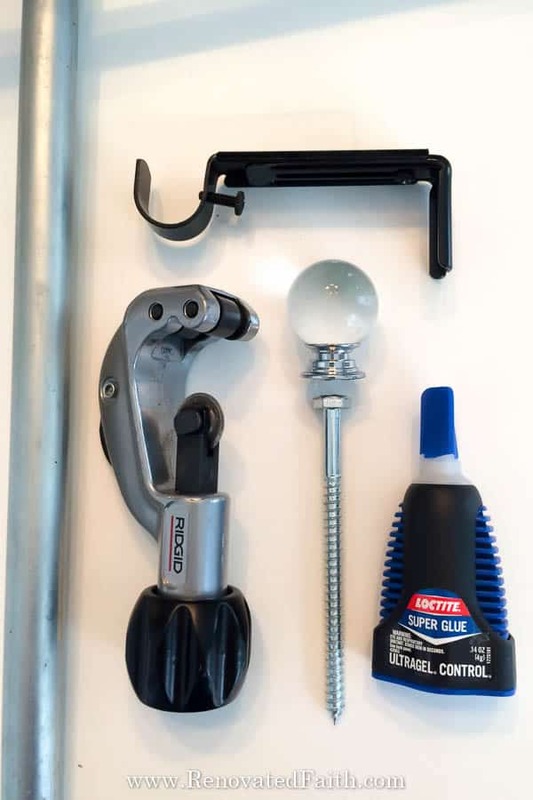 Instead of finials you can make DIY Curtain rod end caps by buying pvc end caps and spray painting them. Just super glue them onto the ends and no one will know you made them yourself. We saved this step until now so we didn’t ruin the paint finish when cutting the rod or gluing the knobs. My favorite spray paint is Rustoleum Oil Rubbed Bronze. It’s very forgiving but read the information on the back about recoat times. At the same time you paint your rods, you will also want to spray paint your finials (cabinet knobs) and any other hardware. 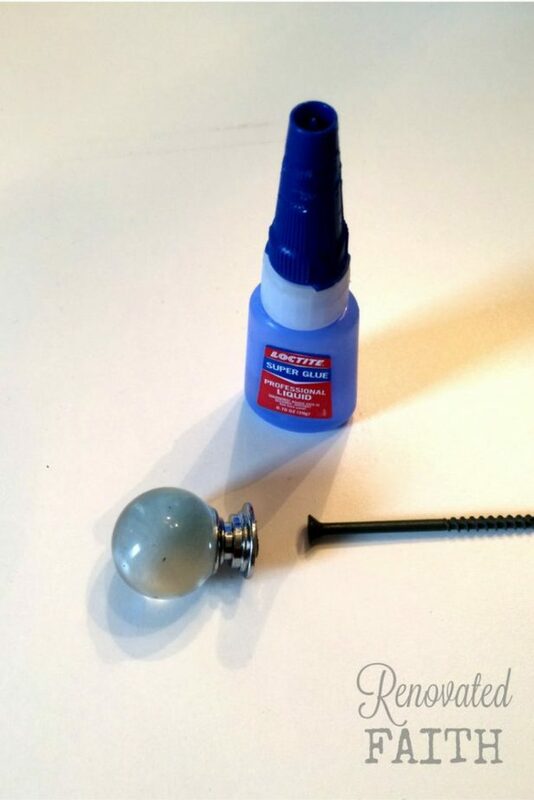 DIY Glass Curtain Rod Finials – To get the look of the Restoration Hardware Glass Ball Finials, you want to tape off the round glass portion with painter’s tape, before spray painting. DIY Oil Rubbed Bronze Finials – For solid oil-rubbed bronze finials, you will spray paint the entire finial. No one will be able to tell that part of it is metal and the rest of the finial is glass. Once it’s spray painted, the whole finial and rod will look like dark bronze. If I had to do this over again, I would have painted the brackets too so they are exactly the same color. After the paint has have dried overnight, I wrapped electrical tape around the screw so it would fit snugly into the end of the conduit. Be sure to wrap at least 2 rows of tape around screw. This will take some trial and error as you find the right amount of tape so the finial end fits. You want a snug enough fit so that the finial stays in place. I just kept adding tape until it was tight enough. Secure it with hot glue if that helps. Hang your brackets and rods and you are ready to add your curtains!!! Here are the rods I made when I made over our master bedroom in Create A Dream Bedroom On A Budget. After attaching the finials to the rods, I hung my curtains. I repeated this project for all 16 windows in our house and estimate that I saved a minimum of $500 if I bought all Target curtain rods. Can you imagine how much I would have saved at a high-end store like Pottery Barn or Restoration Hardware? I’m willing to bet you can’t tell the difference between my glass finials and the ones at Restoration Hardware below. It’s hard to believe that each curtain rod with brackets and finials cost me about $10. 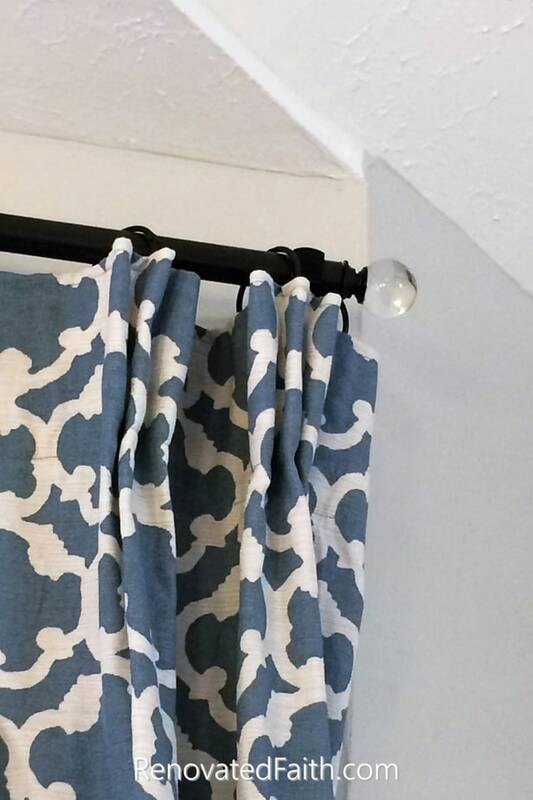 To see how I made my own DIY Curtain Rings and also made pinch pleats the EASY way, check out my post How to Add Pinch Pleats to Store Bought Curtains. To make a custom curtain rod for a bay window, you don’t have to fork out the high cost of custom bay window curtain hardware. Instead, cut electrical conduit in three different sections according to the length of each window. Then you will join each rod with this connector here. 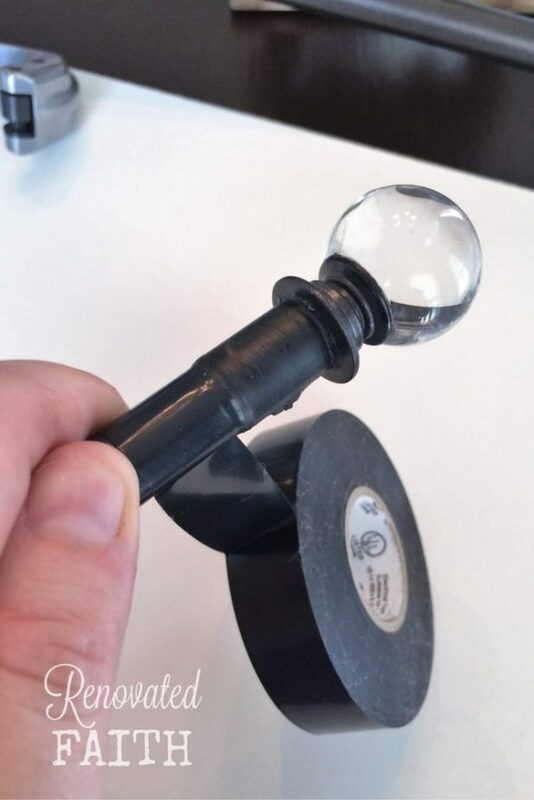 To ensure the end of the connector fits into the curtain rod, you are going to wrap the end with electrical tape like you did above. Once your brackets are installed and you are sure everything is cut to the right size and fits properly, you can spray paint your connectors to match the rods. 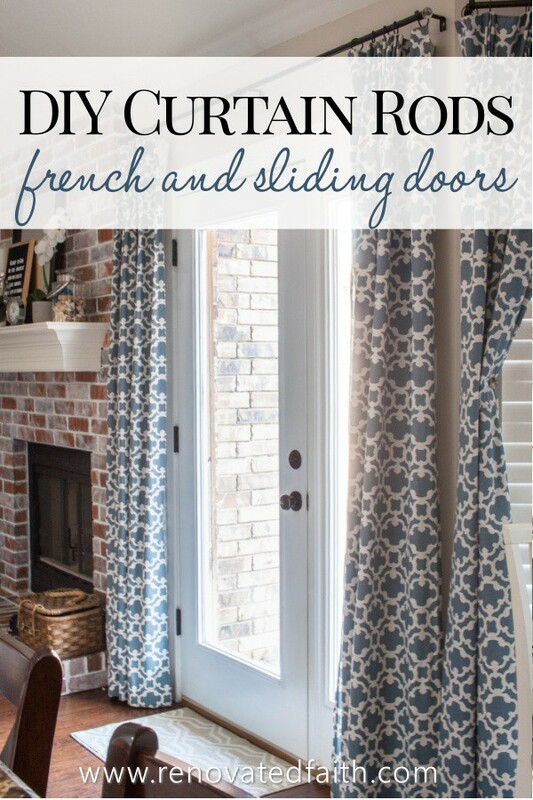 To continue the look of the long curtains in our living room, I used the same process above to make some curtains for our french doors. 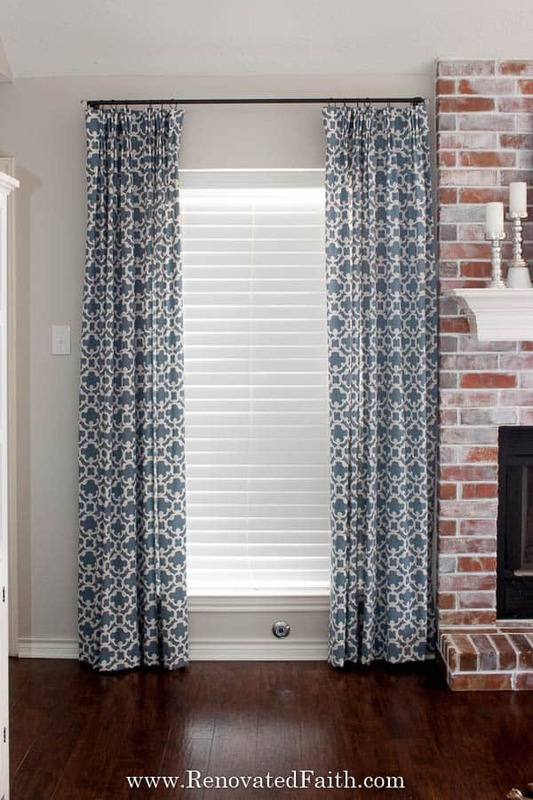 This would also work well for sliding glass doors, where you want to ensure privacy but don’t want the look of verticle blinds. Because electrical conduit comes in lenghths up to 10 feet and sometimes longer, you have a lot of options for extra long curtain rods. You just want to make sure to add enough brackets as any curtain rod will sag without enough support in the middle. If you have an existing curtain rod that is too short and needs extending, it will be easy to cut a piece of electrical conduit and spray paint it to the color of your existing brackets and finials. 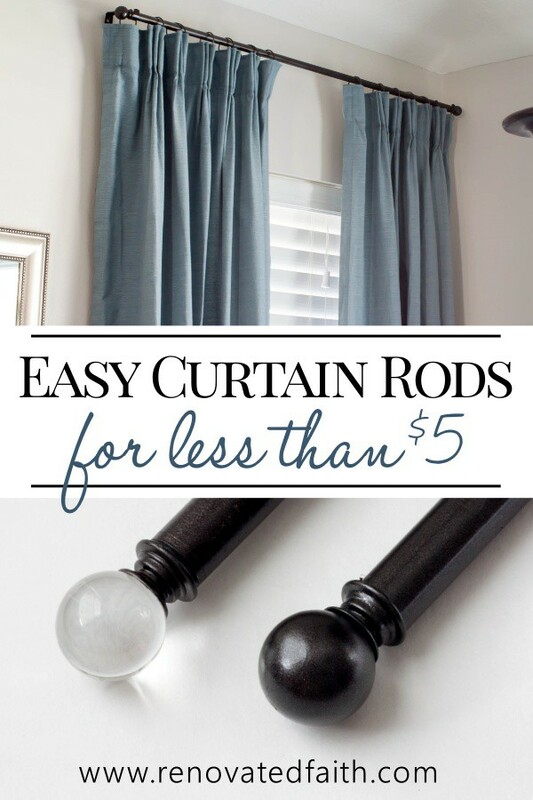 For less than $4 you now have a longer curtain rod that fits with your existing style. 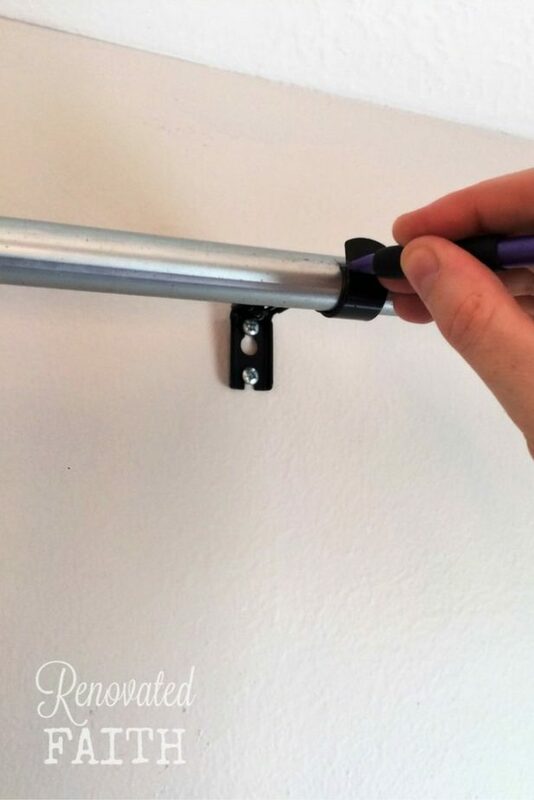 If you have corner windows and need an easy solution for DIY corner curtain rods, use the same connector as I used in the bay window instructions but only cut two pieces of conduit. Now you will hang them so that there are three curtains (one on each side and one in the middle with your connector in the middle. It is best to use 4 brackets (two on each wall) and use rings for your curtains since you are using the connector. 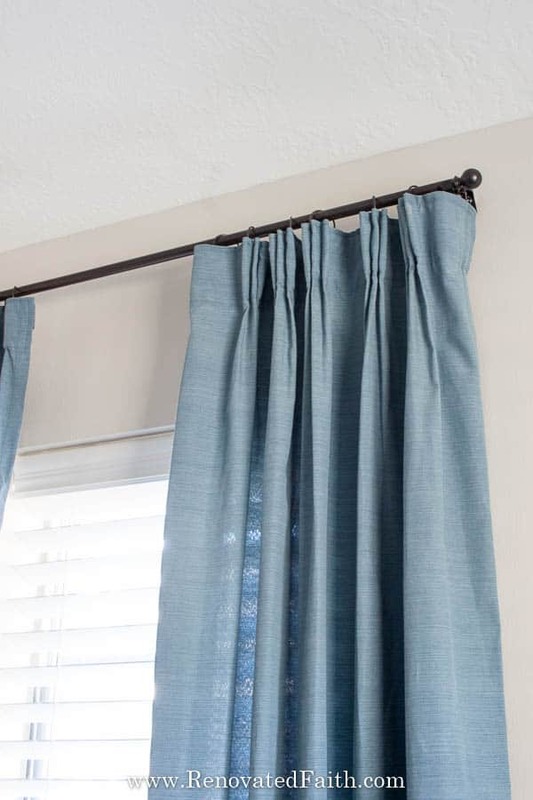 If you like the look of sheers behind your curtains, you will want to make a DIY double curtain rod which is just as easy as making a single. You will just cut double the pieces of conduit and need double the finials but for brackets you will use these double brackets that will work well with the 1/2″ conduit. Wow! You did a fantastic job! That is such a spectacular savings to boot! Thanks for teaching us how to do this. Btw…your bay window is divine! Thanks so much Natalie! I’m amazed at how similar our styles are! Thank you for your sweet encouragement as always. Wow! Those look great and I love all the pictures. A friend of ours used electrical conduit for deck rails and it looked amazing. Thanks for thinking out of the box. It is super versatile! I can totally see it for deck rails. I also thought about using it somehow for those industrial looking shelves. Thanks for reading Christina! So many great tips! Thank you Karin! Thanks so much Chris! I got so many strange looks in Home Depot, carrying 10 foot conduit through the store. It was fun! Okay, the “tie back” rod idea is amazing!!! I love this and I love that you can customize the look with whatever knobs and paint color you want. Genius!! Thank you so much Keri! It is really a flexible concept and can go with whatever decor. Absolutely beautiful!!! Can’t wait to see them!!! Thank you so much! I can’t wait for you to see it. Thank you Mihaela! I had a lot of fun doing it. Thank you so much for this detailed post! I don’t have near that many windows to dress, but I do have three windows side by side in my living that requires a really long rod. The current large golden oak curtain pole needs to go, and I have a handy husband and a love for oil rubbed bronze spray paint and pretty knobs, so I think is what we need! You did an amazing job! Thank you so much for your sweet comment Vicki. Glad the post provided you with some inspiration. Isn’t Oil Rubbed Bronze the best?!? Thanks for sharing this great tutorial. I also have lots of windows, and being able to dress them and save money, is a must. You are a lifesaver. I will make sure to send you a photo, when I do this, and tag you if I post photos. Have a Blessed and Prosperous day. Thank you so much Brenda. I would LOVE to see a picture. Thanks again! Thank you for this tutorial. I love what you did. 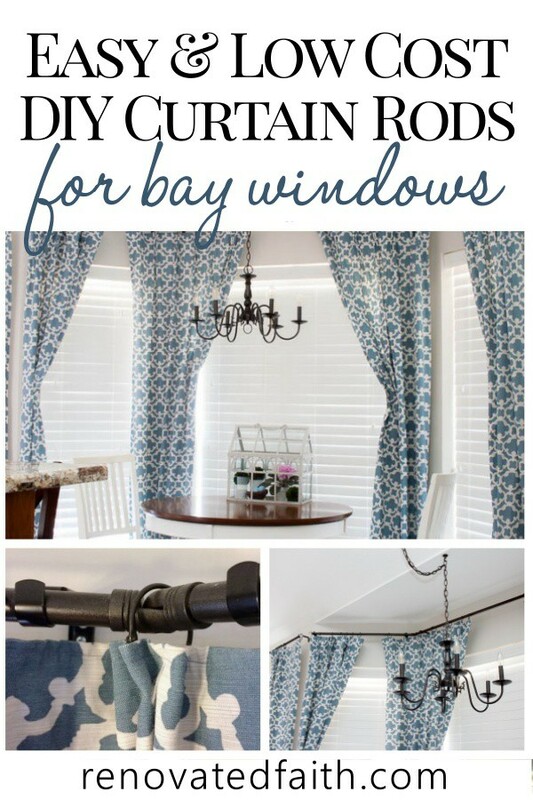 I am in the process of updating my home and I am so glad you included an easy tutorial for the bay window. This is perfect for my dining room. Thank you so much Teresa. 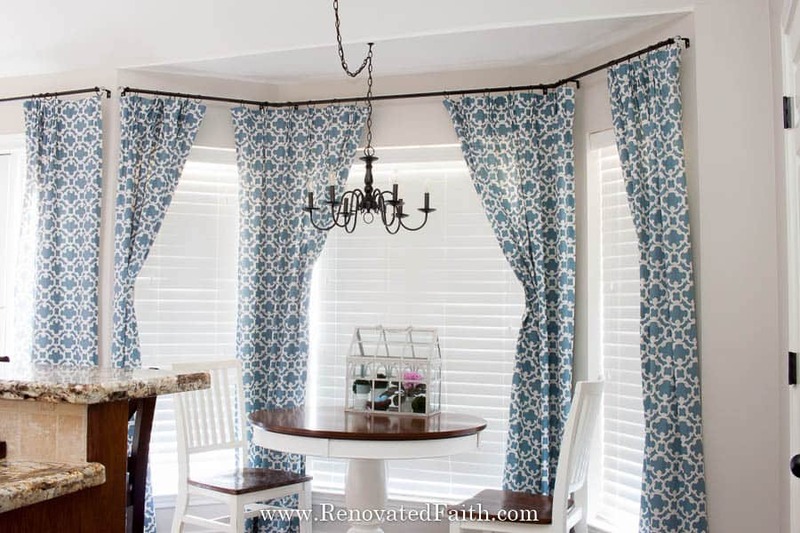 Be sure to check out my post after this one about using binder rings for curtains rings. They make it SO much easier with a bay window when you are getting the actual curtain hung on it. Thank you for your sweet comment!